After the Vodafone’s Prepaid blackberry services, Tata Docomo, the youngest and fastest-growing pan-India GSM Mobile service operator join the bandwagon of “Prepaid BlackBerry” and introduced new, affordable and exciting prepaid plans with Daily and weekly preferences. 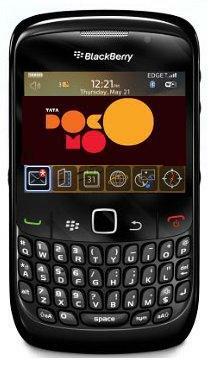 Tata Docomo prepaid customers can choose from two service plans BlackBerry MaiLite, which offers customers access to e-mail and instant messaging services, and BlackBerry Internet Service, which also offers access to e-mail and instant messaging, as well as social networking sites and Internet browsing. The new prepaid plans include daily and weekly BlackBerry service plans for customers in India. BlackBerry MaiLite and BlackBerry Internet Service are available at monthly packages of Rs 299 and Rs 900, weekly packages of Rs 85 and Rs 250, and daily packages of Rs. 12 and Rs. 35 respectively. Furthermore to increase the adoption of internet usage on the device, Tata DOCOMO is offering one week free trial usage of internet service on BlackBerry. Under the BlackBerry MaiLite service plan, customers get unlimited access to email and popular instant messaging services. It allows customers to access as many as 10 supported e-mail accounts such as Hotmail, Yahoo! Mail, Google Mail and chat on popular services, including Windows Live Messenger, Google Talk, Yahoo! Messenger and BlackBerry Messenger. As an additional benefit, BlackBerry Smartphones can display messages from multiple mailboxes in a single inbox and support viewing of e-mail attachments. The BlackBerry Internet Service gives customers all the features of the BlackBerry MaiLite plan, plus unlimited access to social networking sites and Internet browsing.